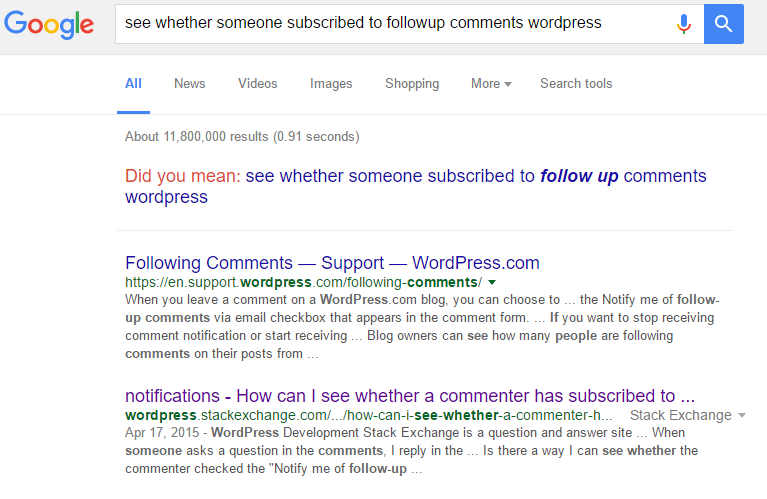 WordPress does offer a “Notify me of follow-up comments via email” option on its comment form. But I couldn’t remember whether there was a way to see whether a commenter had checked that option. Well now, whaddayouknow, the second result sounds perfect. As if someone read my mind. And sure enough that link led to a question on the WordPress site of the StackExchange network. Wow. Someone really read my mind. Reading through the comments it turned out that I had come to the wrong part of the StackExchange network as the “subscribe to follow-up comments” option is provided by JetPack and not by WordPress itself. Bummer. I actually read through all the comments, before my eye caught a familiar name. Looking backup to the question, confirmed it. No wonder it felt like someone had been reading my mind. Someone indeed had! Irony of ironies: turns out I have turned off this Jetpack feature… So I can safely assume that Warren won’t have been notified of my reply to his comment. At least not by WordPress or Jetpack. Still have no answer to my question though. If someone knows how to see whether a commenter subscribed to followup comments, I’d love to hear about it.